Another book by Thomas DiLorenzo? Yes indeed, but this one goes far more into depth than his first blockbuster on the subject. Recall that DiLorenzo single-handedly dragged serious Lincoln scholarship into the mainstream to show that he was not the great liberator but a classic despot in every way. This book explores the network of academics, gatekeepers, historicans, and politicians who invented the myth and keep it alive. You just can't believe what incredible fibs the hagiographers have told about Lincoln--all documented with extreme precision herein. Walter Berns, leading member of the Lincoln cult, said that though Lincoln micromanaged a war that killed hundreds of thousands of his fellow citizens, Lincoln himself "purged his heart and mind from hatred or even anger towards his fellow-countrymen of the South." If you think that's nuts, wait until you see what DiLorenzo quotes from Harry Jaffa! Further, the Lincoln apologists have consistently defended his totalitarian methods of wartime governance. Warning: This book is super hot, written with the passion of a researcher who knows his subject better than all his critics, past, present, and future. 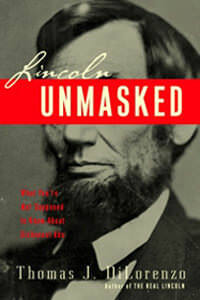 Mr DiLorenzo eviscerates the false truths of "Lincoln the Great Emancipator"
What an eye opener! I have continued to research Lincoln and have come to the conclusion that to have sent 75,000 men into the state of Virginia and war against citizens of our country -- in my estimation was totally uncalled for. He could have made a stronger effort in resolving the issues of the day before sending the troupes. The price for his decision was 630,000 lives forever lost. I would recommend this book highly and also recommend that individuals research on their own. Sometimes the truth is difficult to take.